Why would the largest, best funded, most visible breast cancer organization put so much energy (and allegedly a million dollars per year) into trademarking common language like “for the cure”? 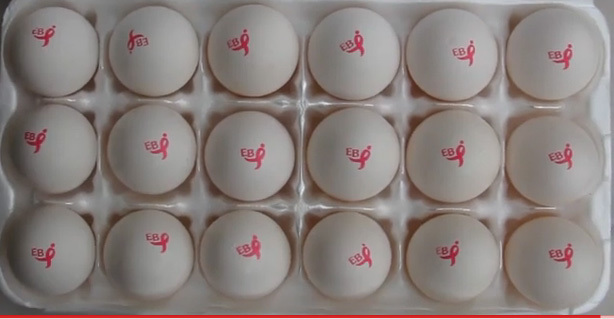 Answer: To control the breast cancer brand. Indeed the cause of breast cancer has transformed from an important social issue to a brand name with a pink ribbon logo. The brand virtually guarantees consumption, revenues, advertising, and heightened visibility. Dominating the breast cancer brand would solidify the organization’s position in pink ribbon culture and in the marketplace it feeds. 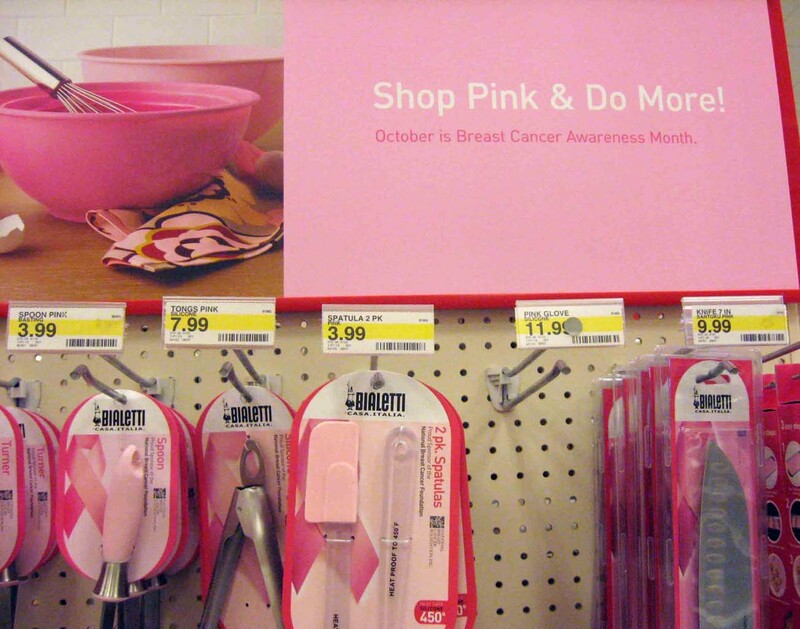 At this point in our history, a pink ribbon on any product or service signifies the cause of breast cancer and a generalized and ambiguous form of awareness. Cultural messages that proffer fear of breast cancer with frightening statistics work in conjunction with hopeful imaginings of an eventual cure and the wholehearted goodness of pink supporters (be they individuals, organizations, or corporations). 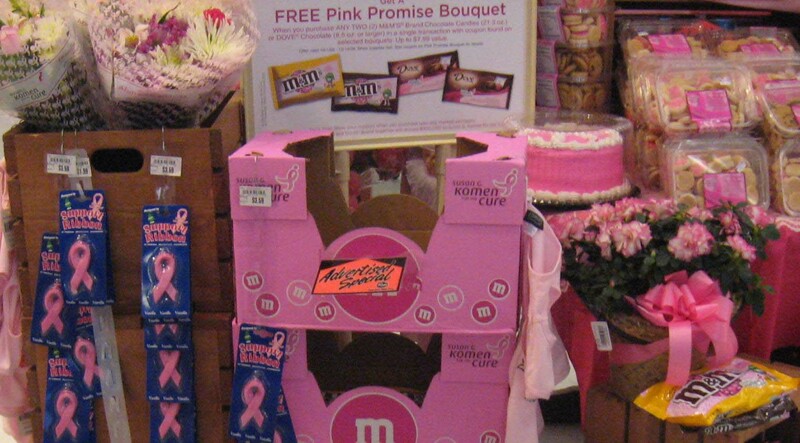 In the end, the messages all lead to one thing: pink consumption. The pink ribbon marketplace has grown from an array of fundraising activities centered on National Breast Cancer Awareness Month in October to a year-round revenue stream with numerous corporate backers. Pink ribbon displays surrounded by shrink-wrapped pink products will readily exclaim, “Shop Pink & Do More!” But the consumptive shift didn’t happen overnight. As breast cancer incidence continued to rise, publicity increased, and advocacy acquired greater national influence throughout the 1980s and ‘90s, breast cancer captured the attention of mass media. Well-known public figure and breast cancer survivor Betty Ford helped to kick off National Breast Cancer Awareness Month (NBCAM) in 1985 with an emotional televised appeal. Every October since then, NBCAM has been a platform for a variety of activities, products, and services related to breast cancer awareness (and especially screening mammography). After the pink ribbon emerged in 1992 as the official symbol, breast cancer became the most widely discussed cancer. Personal stories, autobiographies, news clips, and hearty public sentiment paved the way for corporate investment through cause marketing and advertising. The ribbon had finally transformed from a disease-specific symbol to a brand logo, and the cause took on a life of its own. In the face of runaway ribbons and increasingly unspecified pink support, an organization would have to control the breast cancer brand if it were to have a dominant share of the pink ribbon culture and marketplace. The problem is that the pink ribbon is a generic symbol in the public domain. Any individual, organization, or corporation can use a pink ribbon (and now the color pink) as a visual cue to signify the cause of breast cancer. This is really what the trademark feuds are all about. Susan G. Komen for the Cure® held the name the Susan G. Komen Breast Cancer Foundation from its founding in 1982 until an official name change in 2007. The name change was a branding maneuver that included a pink ribbon takeover. 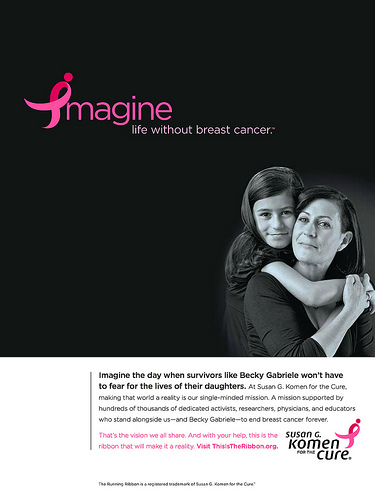 Komen trademarked the stylized “running ribbon” as part of a new logo designed specifically for Komen for the Cure and introduced it in an advertising campaign called Imagine. On the one hand, this makes sense. That a pink ribbon on any surface represents breast cancer and often alleges to raise money toward the fight without providing demonstrable evidence to this fact, is ample reason to press for transparency and accountability. However, trademarking “for the cure” and coupling it with the running ribbon as THE only legitimate ribbon highlights Komen’s efforts to dominate the pink arena. It also suggests an attempt to position the organization above the larger philanthropic community and the hundreds of smaller and poorer breast cancer organizations that comprise the total breast cancer movement. As for non-pink organizations, they hardly get any attention at all. Emotional appeals remind people of what they generally believe in and encourage them to act. The actions are prescribed in the ads. Join the fight. Buy the stuff. Tell your friends. Imagine a future. Komen’s chief marketing officer, Tim Doke, said similarly that the Imagine campaign was “designed to grab people’s attention…touch them emotionally.” He stresses the importance of the imaginary realm when he goes on to say that, “We want people to identify with our mission – to truly imagine the end of breast cancer – and to see our ribbon as an invitation to get active and engage in any number of ways with Komen in the fight against breast cancer.” In other words, we just need to hope that the future is bright, align with Komen’s vision, and participate in official Susan G. Komen for the Cure® fundraising activities. Official merchandise of Susan G. Komen for the Cure® can be found at www.shopkomen.com where shoppers can “purchase with purpose to end breast cancer.” Consumers may also purchase products and services from a large and growing number of corporate partners, each donning the trademarked running ribbon and the official Susan G. Komen for the Cure® name. Unfortunately, consumption has not yet resulted in the eradication of breast cancer. Some argue that it never will. In any case Bassett’s essay and the nearly 300 comments it received since it was published—along with write-ups in the Wall Street Journal, the Chronicle of Philanthropy, and WEGO Health—suggest that Susan G. Komen for the Cure® has some explaining to do. There is mounting public pressure for the Susan G. Komen for the Cure® to create new fundraising standards in addition to making programmatic and organizational changes that would respond to the scientific community, the greater breast cancer movement, the public, and the diagnosed. Komen’s “legal duty to protect its more than 200 registered trademarks” by fighting other organizations over use of the phrase “for the cure” suppresses its moral duty to uphold the public good and ultimately undermines the goal of eradicating breast cancer. Gayle A. Sulik Ph.D. is a medical sociologist and was a 2008 Fellow of the National Endowment for the Humanities for her research on breast cancer culture. She is author of Pink Ribbon Blues: How Breast Cancer Culture Undermines Women’s Health. This is a great article, thank you for writing it. As a parent who lost a child to extremely rare brain cancer, this issue is extraordinarily important to me. Pediatric cancer research is underfunded, and very rare diagnoses like the one that claimed my child’s life in infancy are in desperate need of research. That the Komen Foundation would use donor funds to go after smaller charities working toward the same ultimate goal – eradication of cancer and saving of lives – infuriates me. Please think of smaller charities, with lower overhead, who won’t use donor money on lawsuits, advertising and cushy executive salaries. For pediatric brain tumor research, I recommend the Children’s Brain Tumor Research Foundation.